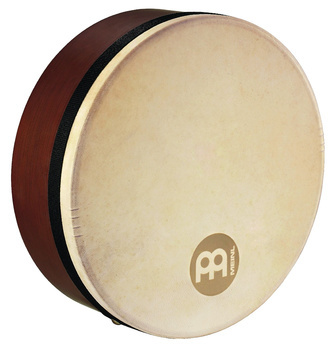 Meinl FD14BE-TF, 14" Bendir Framedrum, Size: 14" x 4", Material: Rubber Wood (Hevea brasiliensis Muell.-Arg. ), True Feel Synthetic Head, Features: Internal tuning system, Buzzing effect, Thumb hole for a good balance and comfortable playing, incl. Allen Wrench, Colour: African Brown, Finish: Matte, The new MEINL Bendirs feature four thin stings stretched across the inside of the True Feel synthetic head, which create the classic Bendir "buzzing" sound. The Bendirs are fully tunable and light in weight for long and comfortable playing.